Martin gives you a multitude of options for making your garage door your very own. Disclamer: See manufacturer’s written warranty for details and limitations. Powder coated doors are insulated. The modern design of glass allows natural light while providing you with security and privacy. Beauty and elegance are at your fingertips. Martin Multi-layered baked-on enamel paint ensures superior corrosion resistance and a durable finish. Includes roller, track and accessories for a strong and lasting door system. Martin safety joint helps protect fingers and hands from serious injury. 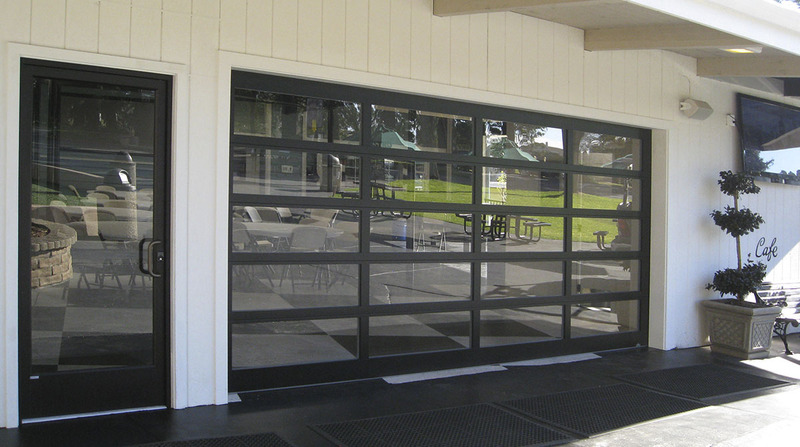 Customized features make Martin Garage Doors a unique and individualized door. Martin’s many unique options and security features bring style and functionality to any door. Available in brass or brushed aluminum. *Cannot be painted. Color matched with the rest of the door. Allows you to open and close the door during power outage. Built like carriage house doors, but without the high maintenance associated with wood. Many stunning handmade designs. Please select from a variety of commercial lift options. Please review our spec guide. 1.01 Work Includes: Upward-acting steel sectional garage doors. Tracks configured for standard clearance [low clearance] [high clearance(Hi-Lift)] [roofline] [vertical-lift] lift type, and [Electric Motor Operators]. 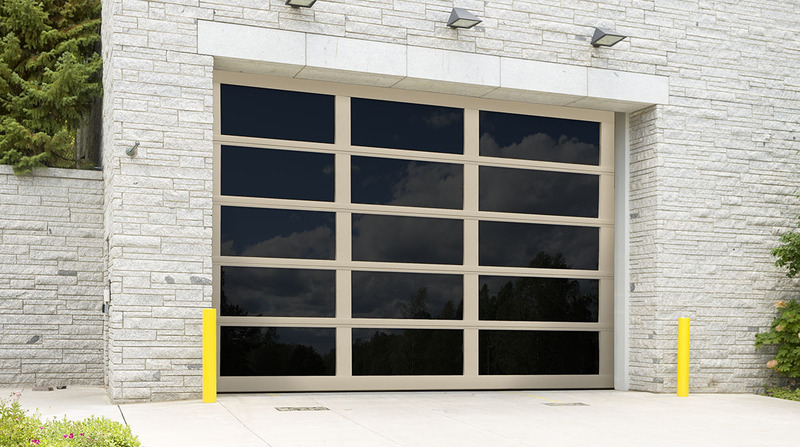 1.02 Warranty: Martin Steel Sectional Doors: Commercial and Rental Properties: 5 year section rust through. 5 year Hardware. See written warranty for requirements and limits. 2.01 Door Section General: Door Sections shall be 2″ (51) thick and 2″ (51) wider than finished door opening. Steel shall be High Tensile 0.016/0.021-inch (0.406/0.533) thick (26/24 ga.) steel equivalent to 25% thicker mild steel for dent resistance. Wind load design: 0.021-inch thick doors shall meet or exceed static pressure and design loads of ANSI/DASMA – 1021996. [Hurricane wind load design.] Wind Speed: 80-135 MPH(130-217KMH) 26 gauge, 90-169 MPH (145-272 KMH) 24 gauge. All Heights in 3” (76) increments from 6’(1830) to 20’(6096), except Athena and Pinnacle which are 1” increments. 2.02 Tracks: Standard G-40 hot-dipped galvanized steel [reverse angle shield] and 2″ (51) [3” (76)] vertical track assembly. Normal clearance shall be 14″ (356) above the door for commercial sizes. 2.03 Door Opening Preparation: [Martin Reverse Angle Shields] can be directly mounted to most flush surfaces. The track assembly requires a minimum of 3 1/2″ (98) side clearance beyond the width of the door on each side. Jambs and header should be flush and jambs should be flush all the way to the floor including concrete footings. 2.04 Safety Features: All interior hinges are “Low Profile” which also reduce the risk of finger entrapment in the door section joint [Finger Shields™]. [Reverse Angle Shields] with rolled edge shall reduce the risk of arm, hand, and finger injury or entrapment. [Roller Shields™] hide rollers and help to push away fingers. All vertical tracks shall have rolled edges with no holes larger than 0.30″ (8) diameter. All lift cables shall be inside design, even on Low Clearance. Torsion spring shall be side-mounted above the door with lock-on side mounted torsion spring assemblies which lower the risk of serious injury to the unprofessional. Extra heavy doors may have a four spring assembly – center mounted. Bottom roller brackets shall lock-on while under spring tension. 2.05 Weatherseal: A 1″ (25) [3” (76)] weather seal shall be factory installed to the bottom door section, held in place by a full door width reinforcing steel galvanized angle. 2.06 Steel Door Section Assembly: Exterior surface; [ribbed][short, raised panel(s)][long, raised panel(s)] [flush] [grooved short, raised panel(s)]. End and center stiles shall have rolled edges for reinforcement and safety. Stiles shall be made from 0.051-inch (1.30) hot dipped G-40 galvanized steel. Door sections shall be [G-30/G-40 0.016/0.021-inch (0.406/0.533) thick (26/24 ga.)] hot-dipped galvanized, structural-quality carbon-steel sheets complying with ASTM A 653 (ASTM A 653M), commercial quality, with a minimum yield strength of 33,000 psi (225 MPa). Door sections shall be dent repairable, replaceable and recyclable. 2.08 Hardware: All hardware shall be heavy duty, corrosion-resistant hardware, with hot-dipped galvanized steel or zinc-plated. #2 Hardened fasteners shall be zinc-plated. Low profile, spring steel pin hinges shall be heavy duty galvanized steel, of not less than .07-inch (2) thick steel and roller brackets to be 0.1/0.13-inch thick. Rollers shall be delron with galvanized zinc shaft, [11 steel ball bearings sealed in case-hardened steel races packed in hi/low temperature grease], with delron tires for quietness. [Roller Shields™] shall be fastened to the first five rollers. Lift cables shall be a minimum 1/8″ (3) diameter aircraft quality. Torsion tube [solid shaft] shall be galvanized. 2.09 Torsion Spring: 20,000 cycles. [50-100,000 cycles] made of high quality, hot-dipped galvanized wire. 2.10 Insulation: [Polystyrene shall be covered with: R8 vinyl back / R8/R14 white steel back (30 ga.(.010)]. 2.11 Options: Acrylic Designer, double pane, insulated, extruded aluminum or steel full-view windows, security windows for ribbed or flush doors, higher cycle springs, electric operators, hoists, etc. 3.01 Installation: Install door according to Martin Door’s written instructions and standards. Installation shall be performed by an authorized Martin Door distributor.